Hello again! 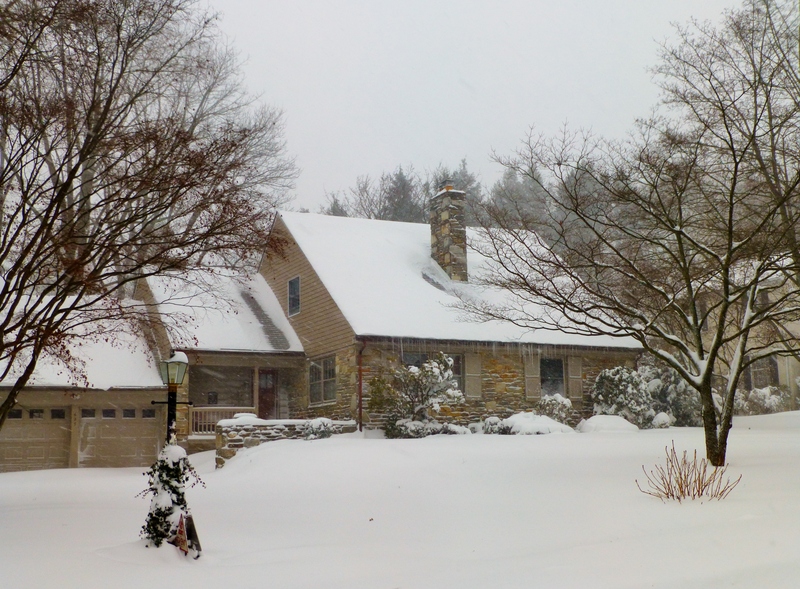 I hope everyone on the East Coast survived the “Blizzard of 2016”, by staying warm and cozy inside their beautiful homes. 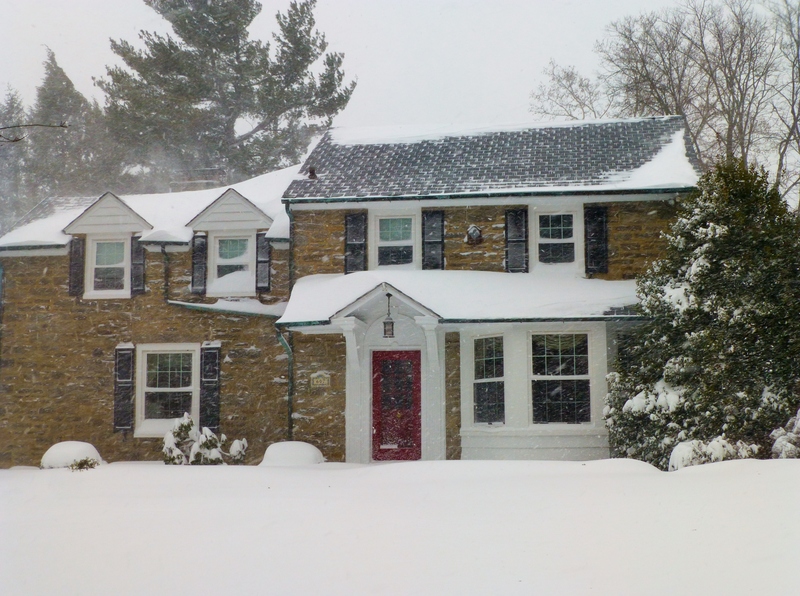 In the Philadelphia Suburbs, we garnered around 25 inches of snow! 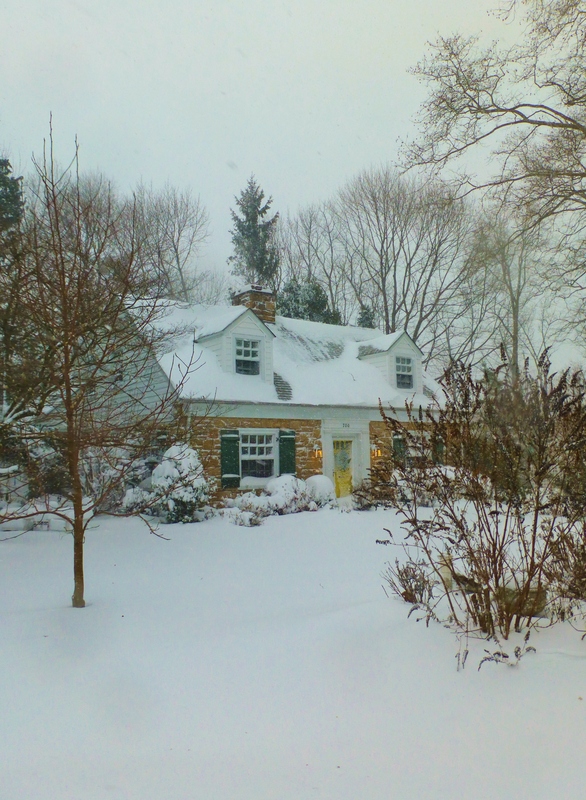 So, needless to say, we’re still digging our way out, here in Abington Township, PA.
My house, Sycamore Cottage, in the blizzard of 2016. So this is a follow up post, of sorts. 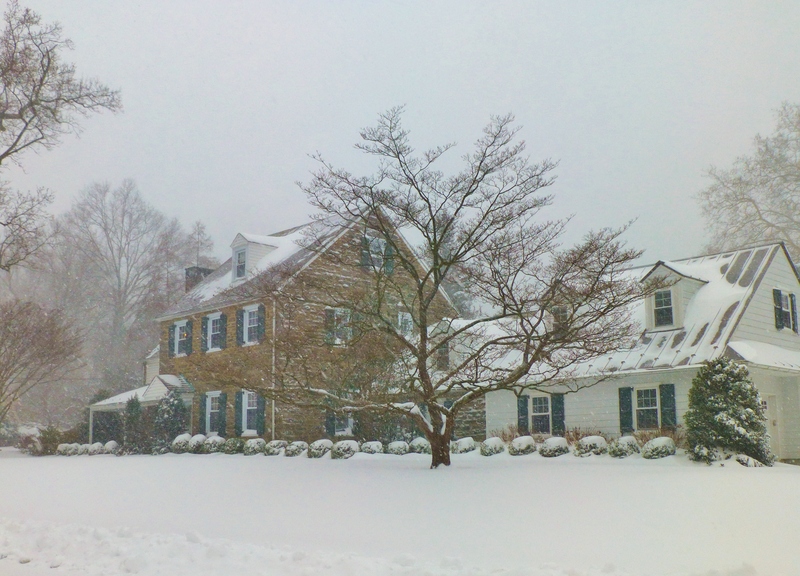 Of course, this storm was much bigger than anything we had last winter. 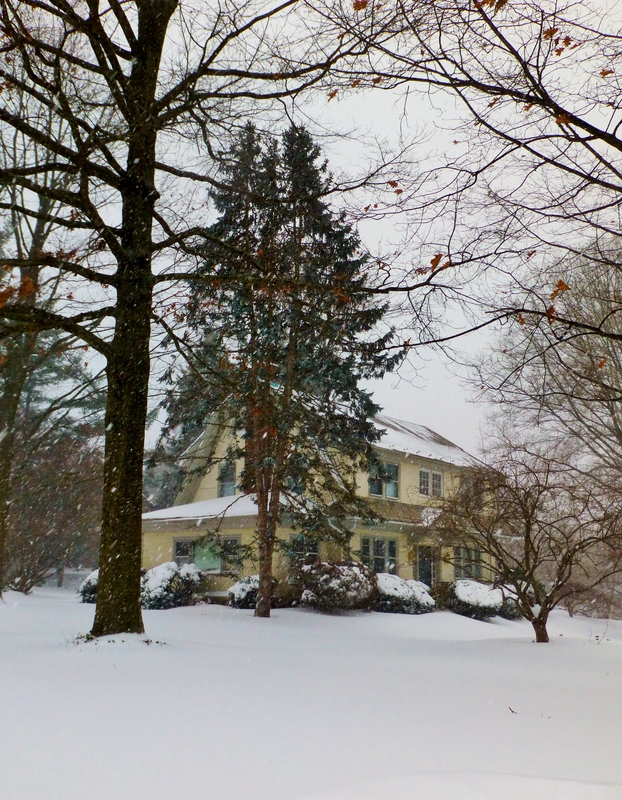 It’s hard to believe that the first and only snow storm we’ve received was such a huge event. We actually had more snow accumulation in this one event, than our snowfall average for an entire winter! 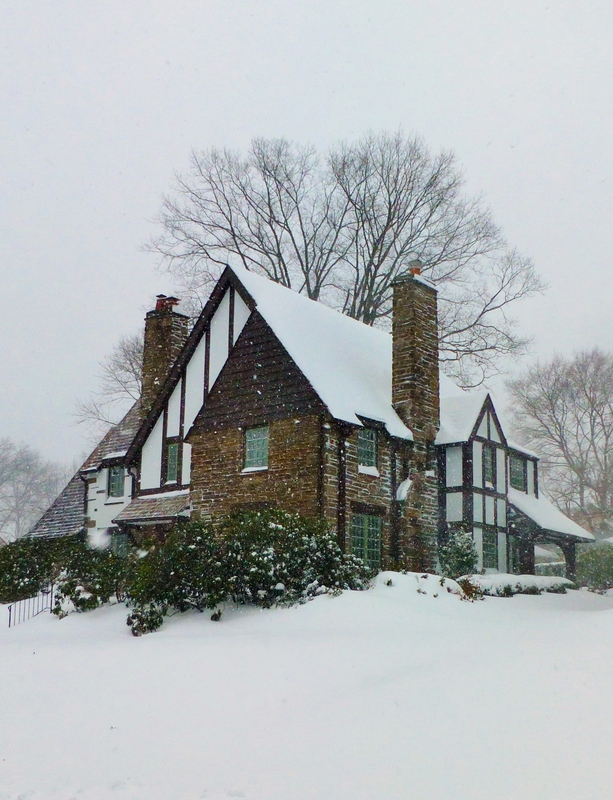 The houses in my neighborhood look so pretty all covered in all that white fluffy stuff! 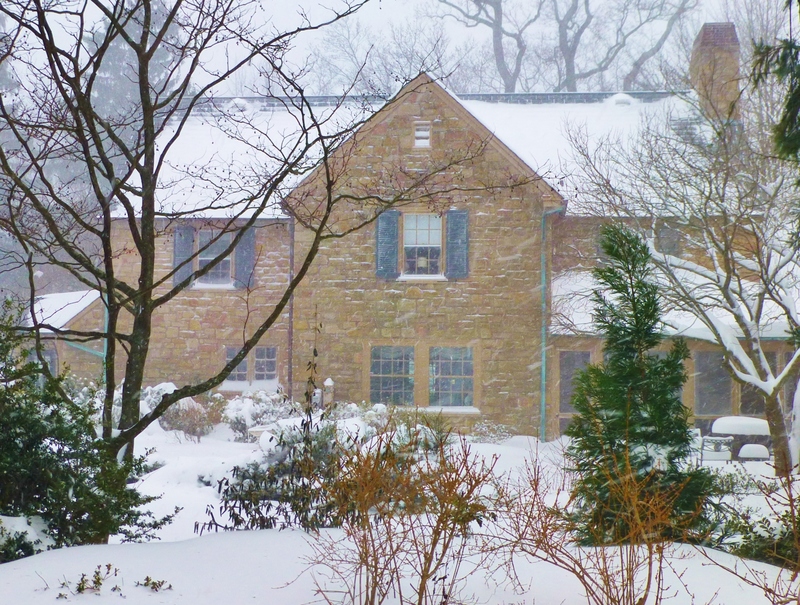 Anyway, I tried to take photos of some different houses this time so I hope you enjoy the beautiful architecture of Abington Township, Pennsylvania as much as I do! These two pastel beauties are looking cozy amidst the blizzard. 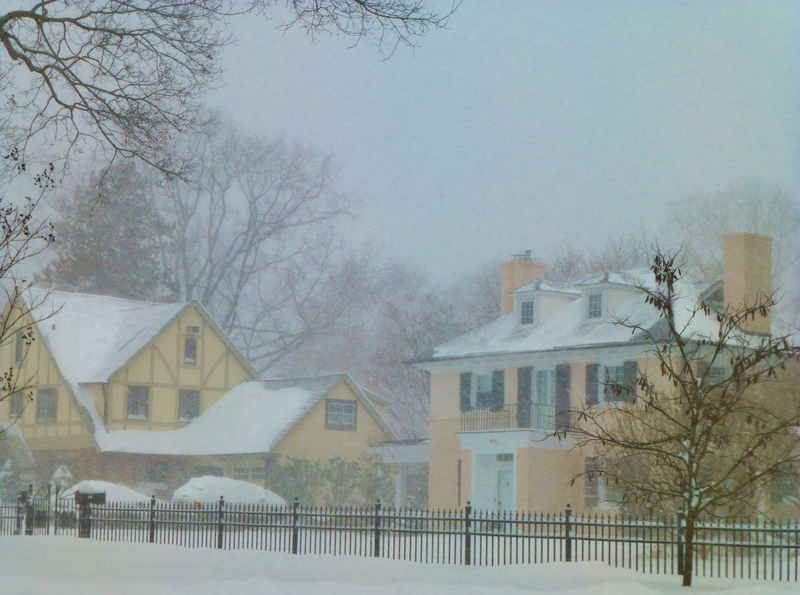 I love how the blizzard conditions soften the photograph taken through the blowing snow. The monuental trees are one of the most beautiful elements of my neighborhood. Look at the gorgeous specimens towering over this large, lovely home! Another cute cottage in my neighborhood. Isn’t it just so charming with the icicles hanging off the front? 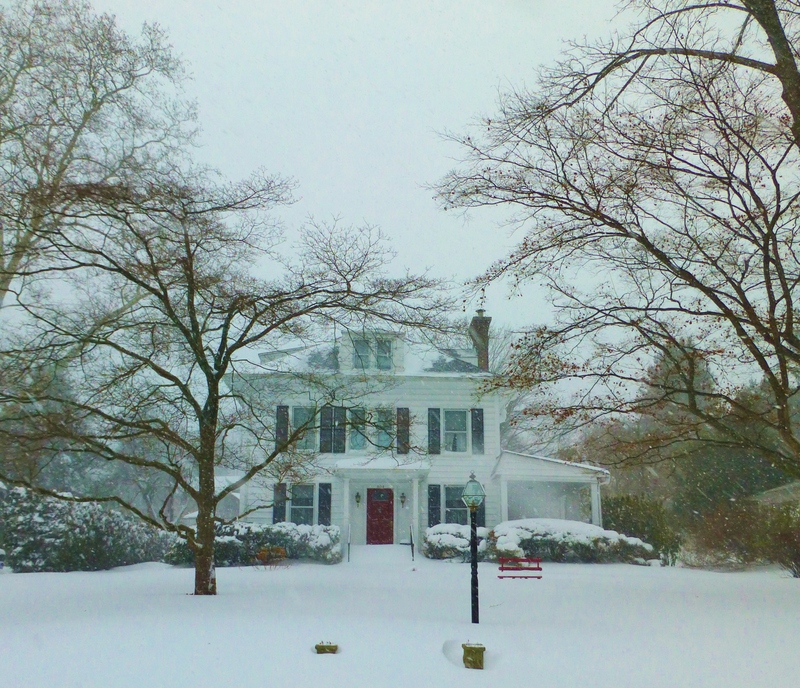 A stone Colonial Style home with its quintessential red door. This is actually the rear courtyard of a lovely home down the block. Such a pretty back yard they have! There are quite a few of these lovely stone homes in the neighborhood, but each is slightly different and unique in its own way. This pretty white four-square is so elegant in its simplicity. It reminds me of farm-houses in the south! I love the red door with the red berries on the tree. This elegant Tudor could be on a Christmas card with it’s lovely wreaths still flanking the arched doorway. 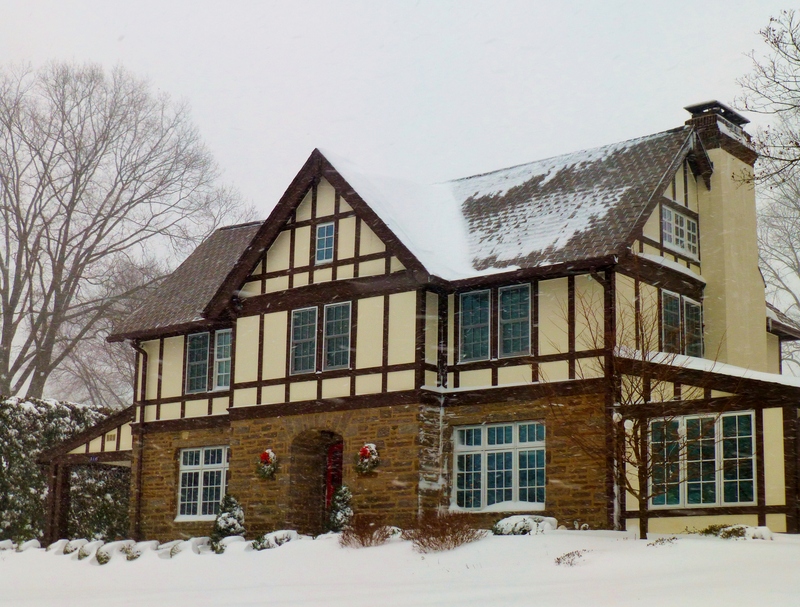 Another stately Tudor Style home. This one has so many pretty eaves and multiple chimneys. Each of these houses is so unique and interesting! Here’s a butter colored cottage with a gambrel roof. 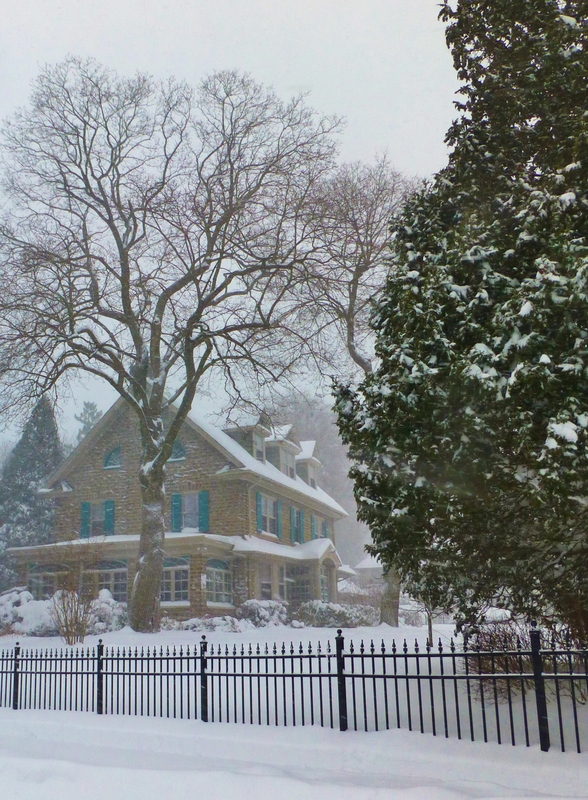 It’s quite charming, all nestled amongst the snow covered trees. This gorgeous 3 storey stone home is just a few doors up from my own little house. Although quite enourmous, it looks small compared to the mammoth trees which surround it! Thanks for joining me on my blustery walk around the block. I love finding beauty in my every day surroundings. Mother nature sure provided us with some gorgeous scenery this weekend–I hope you were able to enjoy it as much as I did! 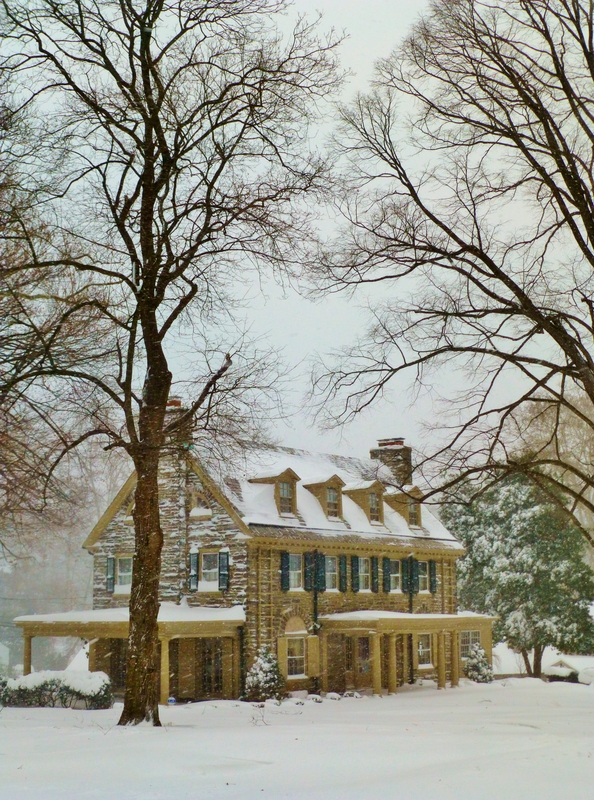 This entry was posted in Architecture, Blizzard of 2016, Mansion, Pennsylvania, Robinson Interiors and tagged Abington Township, Blizzard, Cottage, Gambrel, Houses, Kristine Robinson, Red Door, Snow, Snow Covered Cottage, Stone Colonial, Stone House, Sycamore Cottage, Trees, Yellow Door. Bookmark the permalink. Nice way to spend a snowy day! Thanks for the lovely photos.